Ferguson is starting to heat up again, with more violence, more police crackdowns. And yet we never quite figured out how to make sense of the shocking scenes from last month, which left us little to hold onto beyond lingering outrage. Besides the general sense of horror, the question that still hasn’t really been answered is: Whose fault is Ferguson? Ferguson happened to explode just as the New York Times Sunday magazine declared August “Libertarian Moment Month” — so it’s no surprise that many leading libertarians responded to Ferguson by claiming that the St. Louis suburb’s nightmare was living proof that libertarianism’s “moment” had arrived. Nick Gillespie, online editor of Libertarian house magazine, Reason, crowed about “The Libertarian Moment in Ferguson,” claiming the country was finally waking up to police issues that “libertarians have been raising for decades”; his former colleague Dave Weigel snapped — “Libertarians are asking: What took you so long?”; and the Daddy Warbucks of libertarianism, oil & chemicals giant Koch Industries, boasted that “we’ve worked for decades” on police and criminal justice reform. What gives them so much credibility, libertarians are arguing, is their “decades”-long track record of pushing for libertarian reforms of America’s police departments and its criminal justice system. It's this "decades" of work on police and criminal justice that libertarians insist gives them their unique credibility. That and their slick pitch man, Rand Paul, who wowed Establishment Liberals with his Time magazine snoozer on "police militarization." And the scary thing is, they’re right: Libertarians have been coming up with reform programs for our city police and criminal justice systems for a long time. In fact, some of these reforms have actually become law in places like Ferguson. Poole lamented in his blueprint that the country was still not ready in 1980, and he warned his policymaker readers to expect resistance at the local level if they tried to push through programs transferring the costs for criminal justice (and policing) from general taxpayers to “users.” But one thing that Poole and Reason are very proud of is how they brought ideas from the fringes to the mainstream — and Ferguson is a prime example of how Poole’s neoliberal blueprints on privatizing criminal justice were eventually adopted in cities across the country. To Poole, user fees and “restitution” are just as much a part of the privatization program as volunteer citizen patrols and local "self-defense" protections, of the sort that Trayvon Martin's killer George Zimmerman participated in, under the protection of libertarian-backed Stand Your Ground laws. And that, of course, led him to propose cities shifting the burden of funding the criminal justice system onto its “users" — a concept considered crackpot when he proposed it, but today is part of mainstream political reality. Ladue, Missouri — the richest suburb in St. Louis — features all-private streets. It is the “St. Louis Solution” personified. Ladue also has a 1.0% black population. A few years ago, Ladue’s police chief was fired for refusing to target black drivers who passed through the city limits. Following the Robert Poole blueprint, Ladue sought to cover its $300,000 city budget shortfall through “offender fees” — traffic tickets — rather than by raising taxes on its millionaire homeowners. In 2006, African-Americans made up 22.5% of traffic stops by Ladue police in a town where they were only 1% of the population. 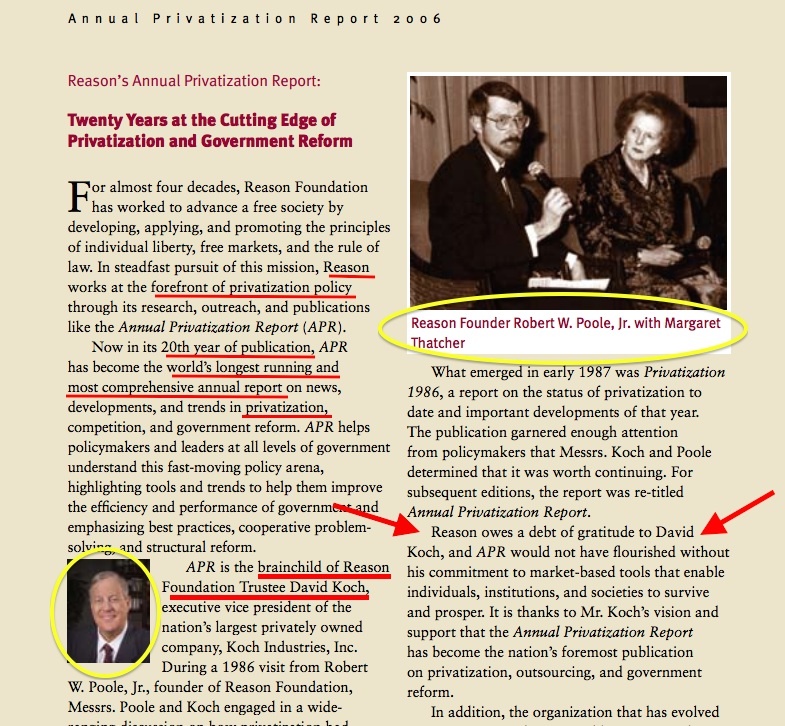 Poole’s role as the Thomas Paine of privatization was something he and his libertarian colleagues at Reason have long been proud of, although ever since the national mood started to sour on privatization post-Katrina, Reason has tended to play down its decades-old record as the country's leading privatization policy mill, and instead over-emphasize more popular causes like pot legalization and ending the War On Drugs. Today “privatization” is so entrenched, such a part of mainstream orthodoxy in both political parties (and the central plank of the fake third option, Libertarianism), it’s hard to believe that privatization was once considered crackpot Social Darwinism just four decades ago. But Poole was a right-wing renegade who floated all sorts of extreme politics for their time, many of which have been adopted, others — like Reason magazine’s promotion of Holocaust deniers, and its many articles defending white-rule apartheid in South Africa, all published under Poole’s editorial watch — were later buried. Of course, Poole’s courageous libertarian proposals to privatize every corner of our lives owe something to his powerful sponsors — a Pentagon DARPA contractor, General Research Corporation, which funded Poole’s first research into privatizing America’s cities; and the Koch brothers, who began funding Poole’s Reason magazine in the early 1970s, and helped Poole set up the Reason Foundation, the seminal neoliberal ideas mill for privatizing every granular corner of our public space. 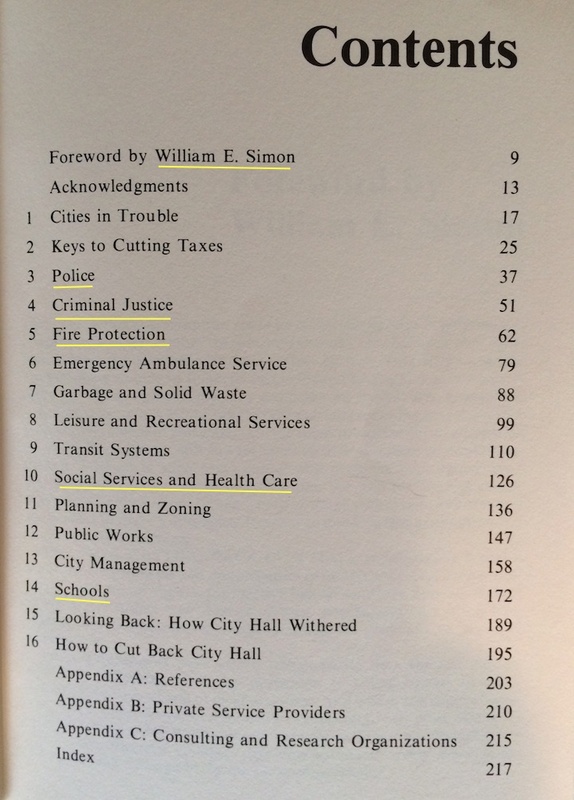 Poole’s privatization primer is divided into chapters that each describe how to privatize a different sphere of local government. After two introductory chapters, Poole’s book gets down to the nuts and bolts of privatizing police departments (Chapter 3), privatizing the criminal justice system (Chapter 4), fire departments (Chapter 5), and so on... down to privatizing libraries and museums (chapter 8), privatizing daycare and welfare services (chapter 10) and finally, privatizing America’s K-12 public schools (chapter 14). 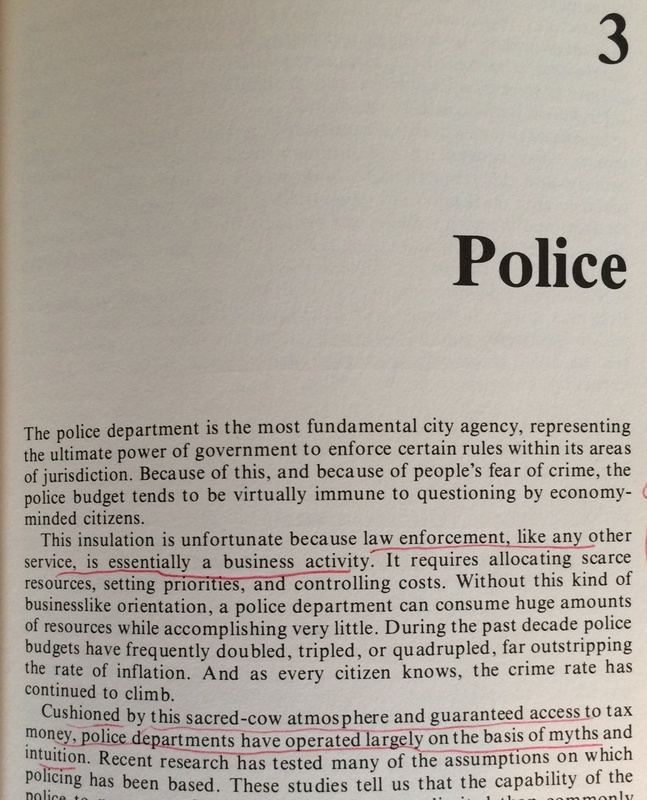 With Ferguson on everyone’s mind, let’s look at Poole’s libertarian blueprint for privatizing city police departments — Chapter 3. “In many cases it may not be politically feasible, at this time, to shift large portions of police activity to a user-pays basis. But the cost of policing may still be reduced, by having the city purchased the service from the private sector. Poole’s proposals for lowering personnel costs include replacing police officers with “lower-paid employees” or “civilians”; a “police assistant program” in which “18-to-20 year old civilians respond in patrol cars to noncrime calls”; handling more distress calls “over the phone” rather than by sending expensive police officers in expensive cars to personally respond to distress calls; and of course citizen vigilante patrols, which Stand Your Ground laws help empower. No wonder libertarians from Radley Balko to the Cato Institute were so protective over their precious Stand Your Ground laws during the Trayvon Martin trial. Finally, Poole reveals an interesting factoid: In the late 1970s, America already had anywhere from 500,000 to 1 million private security people in uniform, compared to 500,000 state and local police. In other words, even before mass privatization, America already had between one and two private cops for every publicly-funded cop. Does anyone keep the stats on this today? Good luck trying to find it. How many people are killed, injured, or violated by private cops? How many private security police are there? How many vigilante patrols and Stand Your Ground murders, injuries, civil liberties violations? Do we have any idea how private cops and private sector spooks violate our privacy and our rights? Who watches them? Why can’t we FOIA their activities? Who the Hell are they? Do we even know their names? Make justice swift and sure. Make the users (i.e., the criminals) pay the costs, wherever possible. Besides making criminals pay restitution to both victims and to cover the costs of arresting, trying and jailing them, Poole proposed installing PROMIS software in prosecutors' offices around the country. PROMIS, as some people might recall, was a controversial database software used by the CIA and NSA to monitor people around the globe. In 1971, when libertarianism was still a budding project of a handful of wealthy right-wing MIT grads — the Koch brothers, Poole, and Poole’s former MIT roommate, David Nolan, founder of the Libertarian Party — Poole laid out his strategy for transforming "statist" America into "laissez-faire" America. Since laissez-faire libertarians would always be a tiny minority, Poole wrote, they should organize in tight-knit groups and "permeate" strategic levers of power. He cited Opus Dei under dictator General Franco in Spain, and the economic technocrats under Brazil's military junta that year, as two examples that libertarians could emulate. “It’s always a pleasure to watch as a good idea, once dismissed as ‘impractical’ or ‘dangerous’ or ‘pie in the sky,’ finally takes hold. Currently, there is just such an excellent public policy idea whose time is arriving. It is privatizing prisons. "REASON has reported in the past on firms such as Corrections Corporation of America that are running penal institutions efficiently, humanely, cheaply — and at a profit. And recently there’s been evidence that the most powerful councils of the public policy establishment are taking notice. “The real obstacle to successful prison privatization has been lack of public understanding and acceptance. Fortunately, as the issue gets more and more scrutiny from policymakers and journalists, that should change for the better.” It took the election of libertarian governor Gary Johnson in New Mexico in 1994 to launch prison privatization as we know it today. The results of Gary Johnson’s prison privatizations were disastrous from the point of view of the public interest, but a success for libertarians and their sponsors. And thanks to cultural amnesia, even after all the inflated cost overruns, corruption scandals and deadly prison riots in New Mexico, today, most people only know Gary Johnson as that whacky libertarian pol who wants to legalize pot. It’s the libertarian grift again, the ol' bait-and-switch repeated ad nauseum. Meanwhile, Robert Poole’s Reason Foundation continues to beat the drum for prison privatizations, issuing reports and surveys down to the granular level, touting the benefits of privatizing prison health care and contracting prison food services, year after year after year. Are you getting the point yet? Because I’ve still only just scratched the surface of how Robert Poole and his Reason Foundation designed the blueprints for our local political economy — from Poole's role in privatizing America's highways, roads and infrastructure, to his proposals to privatize public school custodial services, right down to the "offender-funded" nightmare in Ferguson. They were there at the start, and they’re bigger today than they’ve ever been, brain bugs to both parties and to post-ideological “centrists” like what Gov. Schwarzenegger claimed to be. The point being: When the libertarians at Reason and Koch Industries claim that they’ve been offering a consistent program on reforming America’s police and criminal system for “decades,” they’re telling the truth. But when they claim that Ferguson’s problem is that no one’s listened to the libertarians until now, they’re flat-out lying. Ferguson is our Libertarian Moment — and it isn’t going to end anytime soon.